At the MEDinIsrael conference in Tel Aviv, Director of Analytics and Big Data Dr. Lena Granovsky talked about technology, big data, and analytics' growing role at the company. 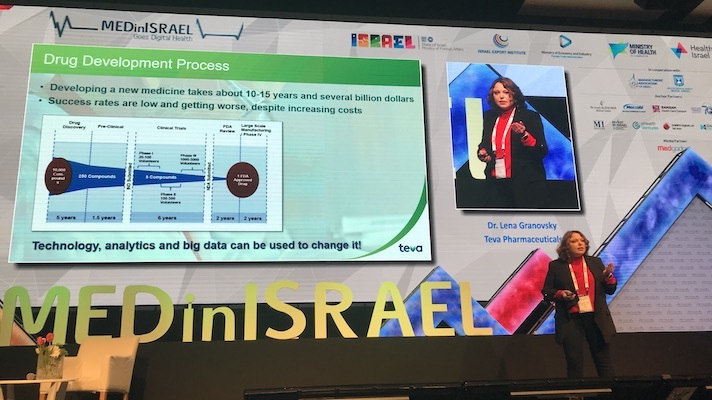 At MEDinIsrael 2019 this week, a conference in Tel Aviv sponsored by the Israeli Export Institute, Dr. Lena Granovsky, director of analytics and big data at Teva Pharmaceuticals, spoke on and off stage about the work the top Israeli pharma company has been doing in digital health. These topics included the company's recently FDA-cleared smart inhaler ProAir Digihaler, as well as more broad discussions about the potential for machine learning and digital health in clinical trials and drug development. When Teva bought Cambridge, Massachusetts-based Gecko Health back in 2015, it was a significant moment for digital health — at the time, it was fairly novel for a pharma company, especially a major one, to buy a digital health company. Yet the technology itself, a sensor-laden inhaler that tracks adherence, was less novel even in 2015, with s smaller pharma called Opko Health having bought a similar startup by the name of Inspiro medical the previous year. And that's not to mention Propeller Health, which had already been developing something similar in partnership with a number of large pharmas. But it’s only now that Teva’s endgame from that acquisition is being revealed, and as the company gets close to its planned 2020 rollout of its connected inhaler, it’s clear that the technology has evolved quite a bit over the last four years behind the walls of Teva’s R&D department. While many connected inhalers are focused only on measuring how and when they are being used, Teva’s new inhaler can also measure peak inspiratory flow rate. That’s a metric competitors don’t measure — and one that Gecko’s inhaler didn’t measure in 2015. While that data might not be as immediately valuable as adherence data, it could prove to be vital for Teva’s big data aspirations. And according to Granovsky, Gecko has catalyzed a culture change at Teva as well. “This team kind of started this technology revolution within Teva,” she said. ProAir Digital Inhaler is a beyond the pill, medication wraparound sort of innovation. But big data and predictive analytics have also become big priorities for other parts of the company, which see value to be gained from these technologies at every stage of the expensive drug development process. Only about 5 percent of drug candidates become drugs, and those that don’t make the cut can fail out for a number of reasons. Measuring the wrong endpoint or outcome is another risk. Granovsky described a hypothetical situation in which a drug might make a patient feel better, but that in turn could lead the patient to be more active, causing back pain they didn’t have when they were sedentary. But if only pain level is managed and it’s only managed at monthly intervals, the results could miss the improvement in quality of life and reflect only the rise in pain level. For many of these bottlenecks, the right digital health platform that lets patients report in the moment via an app, or uses data analytics to intelligently segment populations, can help to counteract the many forces preventing drugs from making it to market.